(Chatto & Windus, 2017); £12.99 hbk. There is only one road, and there is no choice but to take it; to ride atop that stolen wagon straight down over the guilt and dirt and prejudice of an old town, and to stumble, hands and knees to the ground along Laird Hunt’s gravel road all the way to that 1930 Indianapolis lynching. 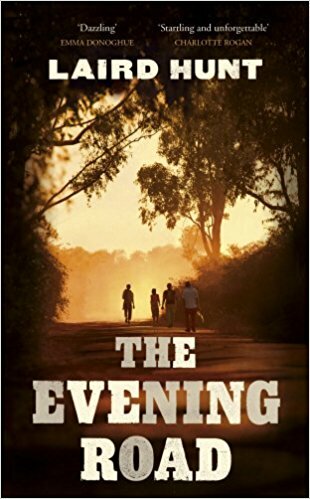 The Evening Road, a historical fiction novel, is thought-provoking, addressing racial tension and cruelty in the same sentences as self-deprecation and personal prejudice. Ottie Lee Henshaw is The Evening Road’s first focus. A formidable character, her introduction is an inner monologue where she fantasises about murdering her boss, Bud, who is, in fact, infatuated with this spirited secretary en route. However, as the narration progresses, Ottie Lee reveals a vulnerability that leaves you pitying her situation almost as much as you scorn her decisions. The second half of the novel is narrated by Calla Destry, a street-smart and audacious sixteen-year-old desperate to escape the sins of Marvel. Set over the duration of one evening and a series of memories, both young women travel the same, intercepting miles, yet always at separate paces. Laird Hunt starts the story at separate ends of the same road and keeps it from stalling at the crossroads, significantly evident in the transition from one narrator to the next. Basing the novel on a recognized event in history, Hunt risked ‘retelling’ in his pursuit of an original plot, and succeeded. While his characters might be considered stereotypical, they come alive not in spite, but because of their archetypes. The dynamic between Ottie Lee, her boss Bud, her slacker husband Dale, and old farmer Pops is brilliant. The shifting tension from one character to another as expectations are unmet and simultaneously surpassed is executed with a depth of mature, practiced style. Hunt’s use of language and unhindered sense of description reveals humanity in a raw, unprotected sense and intentionally veers away from over-sympathetic and emotive responses. This leaves the reader somewhat detached from a narrative rightly associated with grief and demanding of empathy, and allows Hunt to focus on the strength of his narrators solely as individuals, and not as images of their race. Inventive and authentic, Hunt’s use of dialogue ushers the journey onward, from the novel’s very first to final page. It spurs not only the characters within the narrative, but also sustains the curiosities of his readers. Using the once-accepted now derogatory terms “cornflower” and “cornsilks” to differentiate between whites and blacks immerses the reader into an authentic representation of 1930s Indianapolis. The physicality of the lynching itself is left in the background as the narration follows the two women further away from Marvel and towards their own internalized fears. The intensity of the racial prejudice acts as a literary framework, enabling Hunt to focus on the persecution that both women felt themselves and, in turn, inflicted upon others. At times, the momentum of the novel seems to lose itself in shifts from present to past; however, the digressions are understandable and are diverted by Hunt’s focus on characterization over plot. In The Evening Road, Ottie Lee and Calla Destry are headed in different directions, whether it be towards Marvel and the lynching or as far from it as possible. These two characters are truly compelling as they seek to not only evade the consequences of their past, but also to face the challenges of the present. It is only as the book begins to find resolution that we wonder whether they will even arrive at all.